Fresh on the heels of California’s groundbreaking $15 statewide minimum wage action, New York’s Governor Andrew Cuomo and the state legislature reached their own historic agreement this week to raise the state’s minimum wage to $15, marking a tremendous victory for the workers in the Fight for $15 movement in the state where it began. The plan sets all regions in the state on a path to a $15 minimum wage: the minimum wage in New York City phases up to $15 by December 2018 for businesses with more than ten employees, with an additional year phase-in for smaller employers, and to $15 by December 2021 in Long Island and Westchester County. Upstate, the minimum wage will increase to $12.50 by December 2020, with provisions for further increases to $15. Taken together, when fully phased in, the California and New York plans will deliver meaningful raises to roughly 10 million underpaid workers and provide the coverage of a $15 minimum wage to nearly one-fifth of the U.S. workforce. Still, the New York plan is not as strong as California’s, even though it phases up to $15 more quickly in New York City and the downstate suburbs. Republicans in the New York state senate, who hold a slim majority in that chamber and initially opposed any increase, insisted on the lower wage rate of $12.50 and longer phase-in to $15 Upstate, as well as a smaller increase in the minimum wage for tipped workers throughout the state. Those issues could be rectified if the Democratic senate minority becomes the majority. But even so, the significance of two of the nation’s largest states both enacting $15 minimum wages – in the same week, no less – is truly monumental. It clearly establishes a $15 wage floor as the national benchmark for strong minimum wages. 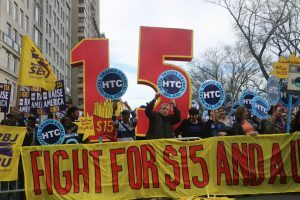 And, as New York shows, the fact that $12.50 has become the compromise position for minimum wage opponents shows just how far the Fight for $15 movement has come in galvanizing and wielding worker power. As we’ve seen recently in Alabama, where opponents of minimum wage increases retain the power to suppress wages they will do so. There, they rammed through a measure that stripped away a minimum wage increase for 40,000 of the lowest-paid workers in Birmingham and banned every city in the state from enacting local higher minimum wages. But as workers across the country see the growing movement for a $15 minimum wage achieving substantial wins from coast to coast, and with similar measures advancing in other states and cities, workers in places like the Deep South, the Great Plains, and the Mountain West are increasingly likely to grasp that what may have seemed impossible just a few years ago – winning a living wage of at least $15 as a minimum wage – has, in fact, proven possible. And that the Fight for $15 is now a movement that’s verging on unstoppable.